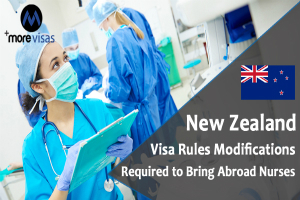 Existing Visa rule modifications are required to bring Overseas Nurses to New Zealand. As per The Association survey of Aged Care, there were 500 jobs in the rest homes for nurses. It would further worsen as nurses in New Zealand have succeeded a pay rises of among 12.6% and 16% making their hiring very high. Though several care homes pay high salaries, however, it was not enough on an incentive regarding the rules of Immigration, as per the Radio NZ. The modern New Zealand Immigration rules enable you to apply for a Work Visa if your profession is in the List of Skill Shortage Long Term. If awarded, the Visa enables you to work and live in New Zealand for a maximum 30 months. You can appeal for Residence after finishing two years. However, you cannot combine your family while appealing for the Work Visa. You could be qualified for the Resident Visa only if you have resumed employment in New Zealand for a minimum two years. Also, your salary must be NZ $45,000 or higher. Stopping the nurses from bringing their families and the chances of having to leave New Zealand following three years are discouraging them. Aged care is a primary part of the social services of New Zealand. Older people are helped to sell off their assets and move into residential care. It is done to assist with the shortage of housing. However, with a lack of aged-care workers who are skilled, the care homes are not able to grow. There aren’t plenty of Nurses in New Zealand to satisfy the shortage. Aged Care is hard work, and you require specific nurses who are specialized for the same. Also, the popular Visa rules interrupt the relationship between the aged and their carers when they want to leave New Zealand following three years. Subscribe to our MoreVisas Newsletters to get more information and updates about Visa and Immigration. We also assist with the smooth and quick visa process.